The historic landscape area of Llanrhidian comprises the core settlement and parochial centre of Llanrhidian and its immediate agricultural landscape. The boundaries of the area skirt the reclaimed land of Llanrhidian marsh to the north extending west to the boundaries of the sub-manor of Leason, to follow the edge of Cefn Bryn Common to the south and the limit of the monastic grange land of Cillibion to the east and excludes the high ground of Cil-Ifor. The area was originally located within the Welsh medieval Cwmwd of Gwyr, within the Cantref of Eginog, later the area formed part of Gower Wallicana, held under the manor of Landimore through out the medieval period. During the reorganisation of the post-medieval period the area fell within the Hundred of Swansea in the County of Glamorgan. It has been conjectured that during the early medieval period the area formed part of a much larger 'maenor', remnants of this large estate survived in a much-reduced form following dismemberment under Anglo-Norman control. It is thought that Payn de Turbeville inherited this larger Welsh unit, and that this larger holding was broken up as a result of grants to religious orders, so that by the 12th century the manor retained only the dispersed sub-manors of Rhossili, Landimore and Llanrhidian (Draisey 2002). The western boundary of the area with Weobley and Leason appears to date from 1304, when John de Turbeville, then lord of Landimore, granted the western portion of sub-manor of Llanrhidian to David de la Bere as a separate knights fee (Nicholl 1936, 168, 173; Draisey 2002). It is likely that there may have been some form of settlement at Llanrhidian during the prehistoric period, given the proximity of the major hillfort at Cil Ifor Top (HLCA 066). Cooper suggests that the site was ideal for settlement development, with two 'excellent springs' at the base of the escarpment and with the proximity of different land types, i.e. the location at the boundary of estuarine marshland, higher plateau, limestone lands to the west and acid woodland and pasture to the east (Cooper 1998, 50). 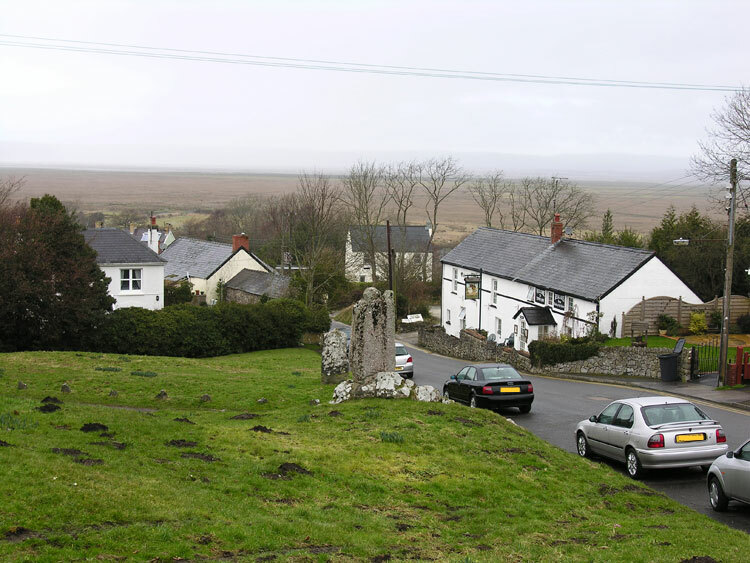 Documentary evidence suggests that by the early medieval period a monastic cell had been established at Llanrhidian; a reference in the book of Llandaff of c.650 has been interpreted as indicating the existence of a cellula at the site dependant upon the main monastic estate at Rhossili (Davies 1979, 97). The site has also produced an Early Christian carved stone of 9th-10th century date, the so-called Leper stone (00092w), thought to be a representation of the meeting of SS Paul and Anthony in the desert. The stone, which is considered to be architectural, possibly a lintel, would suggest that the pre-Norman church was of some significance (RCAHMW, 1976c, 62-3 951). A further indication of early date for the church at Llanrhidian is the partly curvilinear shape of its churchyard and its dedication to SS Illtyd and Rhidian, the dedication to St Illtyd confirmed by Merrick (James ed 1983, 119). Further evidence of early medieval significance is provided by a now lost Early Christian monument (01454w), an inscribed pillar-stone sketched by the antiquarian, Edward Lhuyd as being located to the west of the parish church. In about 1167 William de Turberville granted Llanrhidian Church (00103w; 301495; LB 11533 II*) to the Knights Hospitallers of St John. It is likely that construction of the existing church was started in the 13th century under the Hospitallers. It has been conjectured that the chancel and the tower were added in the 14th century. In 1400 the Hospitallers were reproached by the Bishop of St Davids for allowing the church to fall into disrepair, the chancel being described as ruinous. The unusual massive construction of the tower, which includes at its top a base for a beacon fire, suggests construction at a time when defence was paramount. The chancel, which has an inclination to the north, retains original medieval windows; two south windows have trefoil heads, and the east window has simple Perpendicular tracery. By mid-19th century the church was in poor condition, and restoration, which involved the demolition of the nave, was undertaken between 1855-58, the architect R K Penson of Swansea. Further restoration was carried out in 1899-1901, concentrating on the chancel (Cooper 1998, 19-20; Newman 1995, 394; Orrin 1979, 47-50). The settlement centred on the church appears to have been well developed by the late medieval period, with both lower and higher mills known to have been in operation by 1375. The estate map of 1785 and the tithe map of c.1840 clearly indicate the survival of elements of the medieval field system and dispersed land ownership pattern into the 19th century. A tentative reconstruction of the medieval settlement, supported by a survey of 1598, has been attempted: 'a cluster of small farms, a church, 2 mills, 2 springs and lanes leading to the marsh, to the common fields or to neighbouring communities'. The 1598 survey also indicates up to 7 freeholders within the village, which is considered to reflect the number of farms in the settlement. The strip fields shown on the map of 1785 and the tithe map appear to an extent fossilised within the existing field pattern, in fact little appears to have changed since the survey of the 25-inch OS map of 1878. The common fields associated with Llanrhidian appear to have been organised into upper and lower, with the upper extending south of the highway between Llangennith and Swansea, and documentary references to upper and lower farms in Llanrhidian, are considered to allude to this former distinction. A reference to '2 acres of land and salt meadow' dating to 1400 indicates the utilisation of fields along the coastal margins, possibly the 'Great Meadow' to the north of the settlement (Cooper 1998, 50). Little change to the core of the settlement is apparent by the survey of the 1st edition 25-inch OS map of 1878, apart from the addition of a few cottages, a school (boys and girls), the church school established in 1845, and the Welcome to Town Public House, opposite the church; the other Public House of the time, the Dolphin, being shown in situ on the estate map of 1785. Both the 18th century and 19th century maps show the millponds and leat system associated with the settlements 2 mills. The vicarage set apart south of the highway to Llangennith has also been constructed by the survey of 1878 OS map. Whilst the majority of the population of Llanrhidian would have been engaged in agriculture, largely on a communal basis, during the medieval and post-medieval period, other occupations existed often in conjunction. There are early references to milling, and other occupations such as shoemaking (in 1595) chair-making (in 1676) and weaving (in 1638 and 1744), and by the mid-19th century, census returns indicate the village had 2 millers, 4 dressmakers, 3 shopkeepers, a bookseller, 2 teachers, 2 carpenters, 3 tailors, a cordwainer (shoemaker), a cooper, a horsebreaker, 2 innkeepers or victuallers and 3 handloom weavers, in addition to agricultural labourers, and colliers. Later additions included a Post Office in 1890 (Cooper 1998, 51). Interestingly an estate map of 1798 refers to a fair held traditionally at the centre of the village on the waste above the cross at Tir y Merchant; it mentions the right of the tenants of Tir y Merchant to raise tolls on the standings and booths, and that the tenement had a saw pit. The first reference to milling dates to the 14th century (a document of 1323 refers to 2 mills and a weir in Landimore and Llanrhidian, while a grant of 1375 records a moiety in the Nether (Lower) Mill at Llanrhidian to Meuric ap Philip), documentary evidence also indicates that Richard Scurlage held a mill in Llanrhidian in 1400. The medieval mill of Llanrhidian Lower Mill (00825w; 24947) is mentioned again in a will of 1668 and was later reconstructed. A date stone records that Lower Mill was built in 1803 for W M Evans, gent and names the masons as John Beynon and Evan Jenkin and the carpenters as William Edward and George Evans. In 1847 the owners were recorded as the executors of David Tenant, whilst from 1844 the miller was William David, whose widow was carrying on the work in the early 1860s. The name Willis is also recorded here in 1850, and John Willis, miller, of Llanrhidian is recorded in the 1868 directory. The mill has since then been in the ownership of the Willis family, who operated it until c.1950 (Cooper 1998, 32; Taylor 1991, 13). The Higher Mill (01043w and 01488w; 24975), a grist mill of medieval origin, was held under the manor of Nicholaston in 1632 by John William Griffith and Phillip Robert, by 1655 the mill was owned by the Gwyn family into the 19th century, finally falling into disuse from 1860 (Cooper 1998, 31-2). The woollen mill (40903) at Staffel Haegr (also known as Stavel Hager) shown on the first edition 25-inch OS map of 1878, employed six people, including the proprietor, George Dix, in 1851, including weavers, carders, spinners and a quilt maker; this family business, which reputedly produce d high quality goods, is thought to have started operating c.1820 and lasted until 1904. Limestone quarrying and the production of lime in local kilns is recorded from at least the 17th century with a manorial record of 1665 referring to the common of 'Llanrhidian Hill and Alt Common', stating the right of tenants to 'dig stones for building and to make lyme for improving their lands' (Cooper 1998, 52). The first edition 25-inch map of 1878 depicts a concentration of small quarries and associated limekilns (02490w-02493w) on the limestone escarpment to the west of the village centre, the area to the north of Pen-yr-allt. That nearest to the church (02493w) is a fairly large single hearth limekiln, built into lower side of road.